We’ve introduced technology to every aspect of our lives to improve it, but sometimes it feels like it’s doing the exact opposite. We’re constantly being bombarded with work emails, funny cat videos and loud app notifications. It’s almost like we’re no longer in control and that we just react to whatever technology tells us to do. 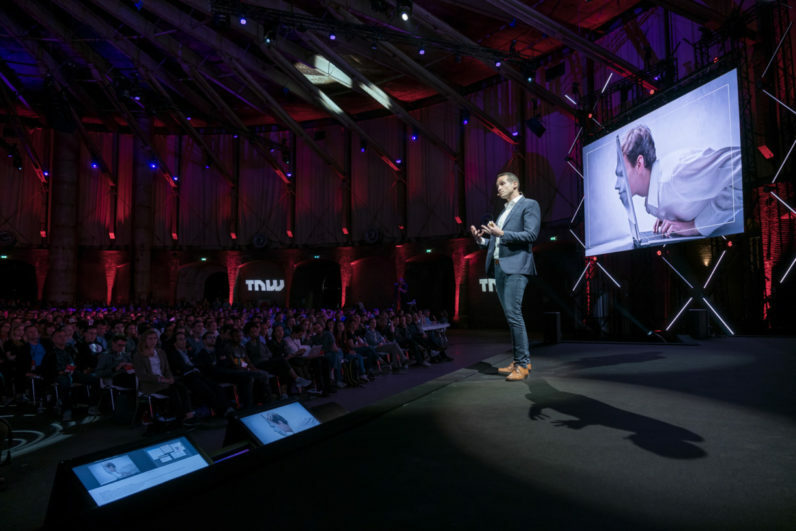 However, there’s a way to put technology back in its place, says Nir Eyal who spoke at the TNW Conference in Amsterdam. Eyal is the author of Hooked: How to Build Habit-Forming Products where he wrote how successful companies subtly encourage customer behavior. In his talk in Amsterdam, however, he showed how we could turn these methods around to make technology work for us, instead of us working for it. When did 9 to 5 become 24/7? For Eyal, the problems that we have with technology can be summarized in two words: dependency and distraction. Technological dependency can take many forms, sometimes as real addiction, but there’s a more common type that most of us are probably familiar with. Many people tell me that they want to use technology less, but that their workplace doesn’t let them disconnect. It’s not necessarily an addiction, because if they won the lottery they’d stop using those technologies, because they wouldn’t need to go back to work. But what they tell me is that they can’t stop working because their bosses, their clients, and their colleagues keep them tethered to technology all day and all night. Eyal wanted to know who or what was responsible for our shift towards a 24/7 workday. It would be easy to blame technology, as it enables us to be constantly connected, but it’s actually a lot simpler. The reason is workplace culture, and the good news is that we can change it. Eyal referred to the work of Leslie A. Perlow, a professor at Harvard Business School who worked with Boston Consulting Group — a company known for it’s constant connectedness — on getting staff members to completely disconnect one evening a week. The results were clear, staff morale and business results improved considerably — effectively destroying the myth that disconnecting would be bad for business. For Eyal, Perlow’s perhaps greatest discovery was that leadership played a very important role in getting people to disconnect. Culture is like water, it flows down through the organization. People constantly look to company leadership for the appropriate amount of technology to use. What this means is that if you’re in company leadership, it benefits you to improve company outcome by setting time for employees to disconnect. Slack is a great example of that, despite being the product that most people associate with being constantly tethered to technology. But according to Eyal, the company culture is that “you work hard and you go home”. CEO Stewart Butterfield wants this message to permeate throughout the company — that it’s a company taboo to bother people off hours — and that’s why it’s actually written on the walls of the company’s headquarters. Eyal’s message is that it’s not technology that’s the problem, it’s the work culture around technology. Fortunately, company leaders and staff can change how they approach and utilize technology — and that’s what we can also achieve in our personal lives. Technological distraction is something everybody is familiar with. Watching YouTube videos, scrolling Reddit and going through the Facebook newsfeed isn’t imposed on us — it’s just fun. However, it’s hard to break the cycle and it can make you feel as technology is hampering your productivity and even making you miss out on life experiences. It’s not really surprising that it’s difficult not to get distracted, because there’s a reason why these distractions are so fun. In his book, Eyal explained which techniques tech companies use to make their products as enticing as possible — so it’s certainly not our fault that we can’t tear ourselves away, but it is our responsibility. We can’t shift the blame to the tech companies just because we like their products so much. Eyal compares it do going into a bakery to complain that their pastries are too delicious, just because you’re on a diet. We live in a world where things are getting constantly more better and more distracting, and sometimes more and more delicious — how do you live in such a world? Well, we’ll do the exact same thing that human beings have done whenever there’s a new technological change. We will adapt our behaviors and we will adopt new technological solutions. When we discover a new technology, we also discover the problems that come with it. With cars came car accidents, but we’ve made them exponentially safer than they were in the beginning. We’ve adapted our behavior by using seat belts, and we adopted new technologies like airbags, sensors and everything else that makes driving today safer than ever before. The best way to tackle the problem of technological distraction is employing the exact same methods, according to Eyal. For example, we can fight the annoying tendency of people getting their smartphones out in the middle of a conversation by adapting our behavior. Eyal believes we can use the same method for smartphones as we used for cigarettes, change when it’s considered to be socially acceptable. Back in the day, every household had to have ashtrays so that guests could smoke, but that’s no longer the case. Either you’ll discover that there’s actually an emergency or you’ll make people realize what they’re doing so they’ll put the phone away and rejoin the conversation. It’s not only social norms that we need to change, however, we also need to fix how we use technology by ourselves. What we can do is change our notification settings, stop bringing our smartphones in bed with us, and use available technology to circumvent the things that make us hooked – such as DF YouTube and New Feed Eradicator for Facebook. There are tons of solutions out there, we just have to adapt to them. Eyal says that the worst thing we can do is to believe that technology is somehow hijacking our brains and that we’re powerless against it. That’s simply not true. There’s nothing inherently wrong or distracting about technology, we just need to adjust it to fit our needs. We can’t go back to when things were simpler, but we sure can put technology back in its place.